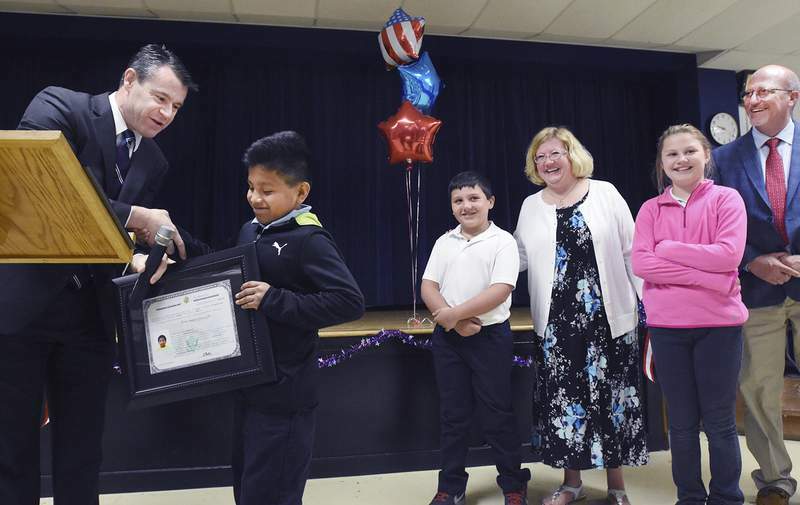 Cathie Rowand | The Journal Gazette U.S. Sen. Todd Young presents a certificate of American citizenship to St. Jude Catholic School fourth-grader Uriel Cochran, a native of Mexico, during a ceremony at the school Friday. Watching, from left, are Uriel's friend Henry Tippmann, Uriel's mother Mindy, sister Kyleigh, and father Don. 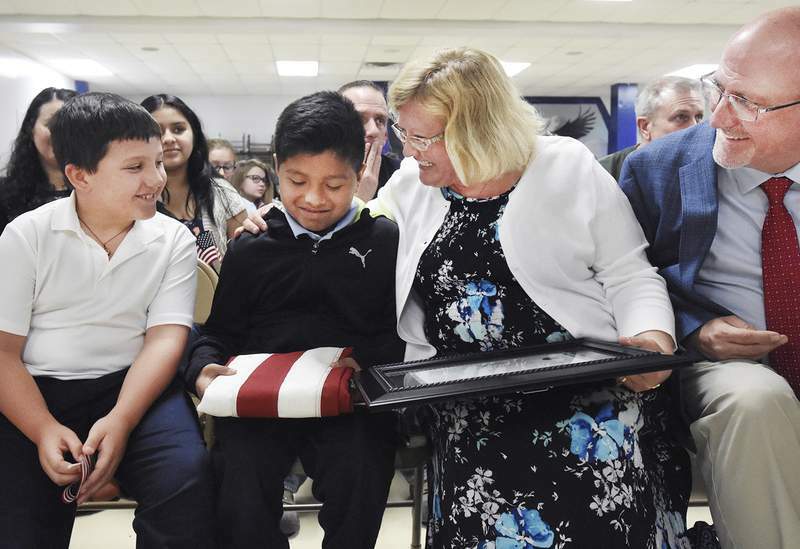 Cathie Rowand | The Journal Gazette Mexico native Uriel Cochran admires an American flag he received from U.S. Sen. Todd Young during a naturalization ceremony Friday at St. Jude Catholic School as friend Henry Tippmann, left, and Uriel's parents, Don and Mindy Cochran, look on. Cathie Rowand | The Journal Gazette From left are new U.S. citizen Uriel Cochran, U.S. Sen. Todd Young, friend Henry Tippmann, mother Mindy Cochran, sister Kyleigh Cochran, father Don Cochran and Rachel Hord, one of the Cochrans' foster children. Uriel, 10, a native of Mexico, became a citizen during a naturalization ceremony at St. Jude Catholic School, where he is a fourth-grade student. Fort Wayne's newest citizen is a 10-year-old adopted foster child from Mexico whose love and trust inspired family, friends and strangers. Uriel Cochran became an American on Friday morning during a naturalization ceremony led by a U.S. senator at St. Jude Catholic School, where he is a fourth-grader. More than 100 students, teachers, family members and friends attended. "It feels good to have somebody by your side when you want them to, so they can be supportive of you," Uriel told news media after the event. "I'm glad everybody was excited for me," he said. Were they ever. Sen. Todd Young, R-Ind., was visibly emotional when he spoke to the gathering. Young's wife, Jennifer, was the childhood best friend of Uriel's mother, Mindy Cochran, when both lived in Paoli, and the Youngs and Cochrans have remained close over the years. Young's wife and their four children came to Friday's program. "I'm excited that today I can call you my fellow American and my fellow Hoosier," the senator told Uriel, who also is known as Uri. Young said that "being a citizen means being a good neighbor. ... This life has too many challenges to go it alone. We need our neighbors." 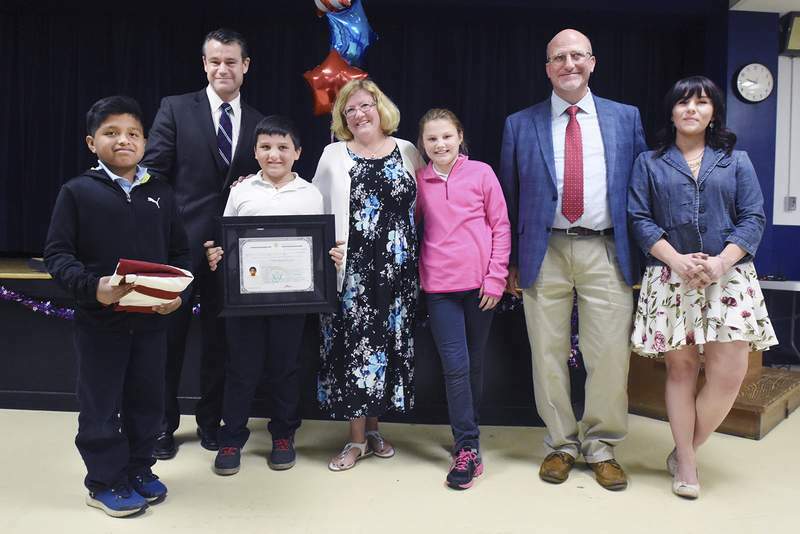 Young presented Uriel with a certificate of citizenship and an American flag that had flown over the U.S. Capitol, telling the boy, "People of this country are proud to call you one of us. Thank you; be a good neighbor." Earlier, Uriel's father, Don Cochran, said about citizenship: "You get out of it what you put into it. And that can be different for different people." Uriel's biological parents arrived in southern Indiana from Hidalgo state in Mexico when he was 16 months old. Two months later, Uriel was removed from his Jefferson County home by law enforcement officers and hospitalized with numerous injuries, obvious signs of physical abuse. Authorities contacted Don and Mindy Cochran, who lived in Madison at the time and were licensed foster parents. They took Uriel home after he had been treated at hospitals in Madison and Indianapolis. Don Cochran, a Fort Wayne native who teaches music and is the band director at Bishop Dwenger High School, and Mindy Cochran, the student life counselor at Dwenger, read letters from Jefferson County officials and nurses who had aided Uriel. An emergency room nurse said the toddler "changed my life" because he "showed me pure, innocent love and trust." Another nurse recalled him as a "sweet, timid little boy that was brave and calm," noted that Uriel is the name of the Christian angel of wisdom and light, and said Uriel is "a true example of God's love and light." Cochran told his son he read the letters "because I felt like it's so important for you to see what citizens do: They step up for people in need, and that's what we want for you to do." The Cochrans adopted Uriel when he was 4 years old. They have another adopted foster child and have been foster parents to 13 children. With bunting and balloons as a backdrop, St. Jude fourth-grade teacher Kathy Gehl gave Uriel a collection of notes to him from classmates. "You are one special young man, and we are so fortunate to have you here at St. Jude School," Gehl told him. Elected officials attending included state Sen. Liz Brown, R-Fort Wayne; state Rep. Dave Heine, R-New Haven; Fort Wayne City Councilman Tom Freistoffer, R-at large; and Allen County Councilman Justin Busch, R-at large. The crowd said a prayer, recited the Pledge of Allegiance and listened to a group of students sing "God Bless America." Uriel, who said he enjoys playing soccer and learning about computers, later acknowledged being nervous during the ceremony. His friend Henry Tippmann, 11, had been at Uriel's side throughout the occasion. "I taught him everything I know," Henry quipped after the whole thing was finished and the kids could be kids again.